“Who Said I was up for Adoption?” was an interesting book to write because not only was Ray a huge education for me (being my first dog), but also because he impacted me emotionally on a consistent basis, and in many different ways. Below is a quote from the book. To set the context, I had already learned the hard way that Ray suffered from startle response. i.e. do not wake him up or otherwise surprise him. Almost 80lbs of German Shepherd/Rottweiler X in aggression mode is rather disconcerting! On one particular occasion I was, once again, sitting on the edge of my bed working on my laptop and Ray was on my bed sleeping, when his feet started gently moving. I watched him for a few seconds and then went back to my laptop wondering what he was dreaming about this time. Perhaps he was chasing a squirrel or a rabbit? A few moments later I heard a quiet whimpering crying-like sound and turned to look, but he was still asleep and his feet had stopped moving. It was quite a pitiful sound and poor Ray was clearly not happy in his dream. I contemplated waking him up, but then thought better of it based on my earlier experiences! He quietened down and seemed quite relaxed, so I returned to work on my laptop. A few moments later there was this loud and quite painful cry which was repeated four times. I have never heard such sobbing with apparent pain. It was so much worse than when he had his first heart-worm injection and he could not get comfortable in his crate. Such a heart wrenching sound, and all I wanted to do was give him a big reassuring hug to let him know that all was well … but of course I couldn’t. Poor Ray, and all we can do is love him and take care of him. That does not seem enough somehow. 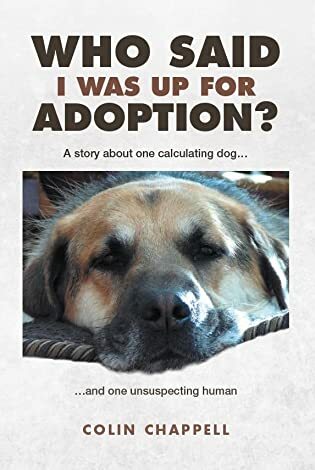 For more information on “Who Said I was up for Adoption?”, please select/click the book cover over in the right column. At least in his waking world, Ray is a happy safe and contented dog. Oh I remember this part. So moving. I wanted to go through the pages of the book and give Ray a big hug too! Have times like these happened more often than this one time that you shared in the book? Ray has not sobbed, or cried out in apparent pain, for a very long time now. He does dream a lot, and we would guess that some times he is chasing down some creature, while at other times he is feeling very threatened by something.